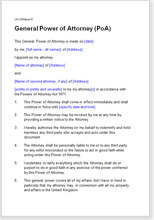 This template creates a general power of attorney (also called an ordinary power of attorney or PoA), which allows you to give temporary authority to someone else so that they can make decisions and act on your behalf. You become the “donor” of the power and the receiver becomes your “attorney”. The actions that your attorney may take on your behalf can be as general or specific as you like and may relate to just one part or the whole of your affairs. With this template, you have complete flexibility as to whom you nominate for your attorney, the powers that you grant, how they should be used and over what time period. You can also specify any matters over which you don’t want the attorney to have power. For example, you may want your attorney to control all but one bank account while you are abroad. One of the features of a general power of attorney is that it is created for a defined period of time, not indefinitely. Depending on what you specify in the document, it can either take effect as soon as it is signed or at a point in the future, so you could draft it now for use later. If you need to cancel the document before its expiry date(called revoking in legal jargon), you can do so using a deed of revocation. It will be revoked automatically if the donor loses mental capacity. The attorney must be notified to make a revocation effective. You do not have to register this general power of attorney with anyone or any organisation. You can grant a power of attorney if you are over 18 years of age and have mental capacity. The attorney must also be over 18 years old and not be an undischarged or interim bankrupt. You can only grant the power of attorney for actions that you already have the right and capacity to carry out yourself. You can’t use it to allow the attorney to make decisions about your welfare. you want to allow someone to perform a specific task on your behalf on a regular basis (such paying your bills in your name from your bank account each month or collecting a pension), or you want to allow someone with greater knowledge of a subject to act on your behalf (for example allowing an estate agent to negotiate buying a house for you).